In The Age today an article about Telstra Bigpond users having ridiculous bills for exceeding download limits when they believe they are doing far from that or even if they computers and modems off. Nigel Hopkinson said he was disputing a charge of $8562.31 for 73GB of excess data use. The apparent usage was recorded by BigPond between midnight and 5.07am on May 10. He received an automatic email at 8.53am from BigPond, advising his account reached 175 per cent of his monthly 60GB usage allowance. He had left his computer and modem on, he said. Other customers that have been affected by excess data usage claimed to have turned their computers and modems off. “I had no software running that would cause this and I do not believe with my connection speed, that it is even technically possible,” Mr Hopkinson said. Well, add me to the long list of customers with this complaint about BigPond. I am on a 60GB per month plan which I went on a year ago because we seemed to be exceeding our 30GB and I didn’t want to worry about it. The problem is that we now seem to be reaching that limit too. Finally, I woke up and thought about it: how? We download lots of TV and movies from iTunes but adding that up, it was clear it could not exceed 10GB in a month. There is plenty of YouTube viewing but even there it was hard to image it exceeding 2 or 3GB per month. Where was the rest of it given that we are all out of the house during the day? I tried an experiment switching off the WiFi just in case it was the neighbours, but the meter kept on ticking away. Surely that amount of downloads each month would be noticable on a hard drive somewhere but it was no-where to be seen. I started to monitor usage closely. Since there are several computers network meters were fine but over-stated usage as they included file transfers. But even with this, they were way under what Telstra’s usage meter was reporting. So I rang technical support. We considered viruses but two things ruled that out: (i) there were no PCs in the house, only Macs and (ii) it was all downloads, with hardly any uploads. Actually, the upload rate seemed high to me but there was a vast asymmetry. I suspect that told them that no computer had been hijacked to send out illicit material and also that I wasn’t downloading illegally and getting into trouble on reciprocal uploads. So that month they reset my limit so I didn’t get extra charges. But what to do? Telstra’s usage meter doesn’t get the time right so even when we switched it all off for a day it still recorded usage (an incredible 200MB!). So I can’t just monitor stuff for a day, send it to them and say, ah ha! I would have to do it for a week or more which would mean limiting to one computer and a big disruption. So I monitor the usage meter because, believe it or not, our usage is correlated with that and so close to the end of the month we lay off the iTunes, iView and YouTube. This article has given me pause and I may make another call to BigPond support, or is it billing? I recall they had trouble working out which department was to blame. If I were you I would switch isps. Why even go to the trouble of complaining to telstra when there are much better plans around? Some isps such as iiNet will not count your iView and iTunes downloads and very few will charge you for going over the limit. I use Cable and they have an unmatched download speed. To set up ADSL (even if available) would require re-wiring various things and I don’t want to do that. I think I should be able to get what I have paid for. If usage meters are inflated that is a serious issue. And I am not alone. Check out this thread. And another thing, the usage meter was down a couple of hours ago when I wrote the post but I just checked usage for today (25th July) at 8:45am — it was 3.485GB! That is for an 8 hour period while we were all asleep and the computers were asleep. The only thing of significance in that time was reading the newspaper on-line and writing this post. Oh and if you think it is a carry over, the previous day had 1.716GB for the whole day too. So in the past two days I have supposedly downloaded high quality video comprising 11 hours of viewing! do you use cable extreme? If not, you’ll quite possibly get similar download speeds from ADSL2+ (depending on your distance from the exchange). ADSL2+ is also less of a shared service than cable so you’ll have more consistent speeds in peak usage times. Re-wiring isn’t a serious problem, you’ll save the one off setup fees by switching to a much more attractively priced naked DSL plan from another ISP anyway. Otherwise if you have to stay and can’t get a resolution with Telstra on this, then log as much detail as you can and take it to the TIO. they have jurisdiction over this sort of thing. You ask “but what to do?” and yet the answer is very simple: change ISP’s. While I’d be the last person to defend Telstra, this is a case of caveat emptor. Most other ISP’s offer shaping for excess downloads as opposed to an additional usage charge, and shaping is the ultimate insurance policy against these sorts of charges. I am a little bit surprised though in this case that the user was on a 60gb plan, usually Bigpond users complaining about these charges are on much lower caps, and either don’t monitor their downloads, or don’t understand what a cap means. Also on your iTunes downloads, iiNet (and perhaps Internode, but I’m with iiNet) offers iTunes and ABC iView downloads for free, that is not counted towards your cap. Helps me every single month. I’ve had a similar problem – but I’m not with bigpond. I seem to have blown my limit in the first week three months in a row. Everyone is telling me to use ‘exit’ but for the moment it is better to use ‘voice.’ BigPond Cable Extreme gives me 40Mpbs downloads and I don’t want to give it up just yet. Then again if I can’t download much who cares. Note that ISPs charge based on raw data volumes, which includes headers, checksums, and ACK packets as well as the data you see. But that’s probably no more than 20%. Spam e-mails can add up, and you may not see them if you filter on the desktop. I don’t know if you have a dedicated IP address, but if it’s externally visible then there’ll be a constant stream of worms, trojans, and malicious scripts scanning your ports and trying to log in. Depending on your network configuration, they probably won’t show up in your logs. Seriously, how many sites are there currently from which you can download at 40Mbps? We signed up on an ADSL2+ plan providing 10+20 GB/month (10 peak, 20 off-peak) at nominal 25Mbps. No charges for exceeding limit but draconian throttling back of speed. Over time the price of the plan has not increased but the download limits have (now 22+30). There is also a handy widget that sits in your FireFox or Explorer title bar that shows you download GB mtd. Sorry, but I also support the argument that the only resolution is to switch ISPs. Nobody cluey in the IT industry uses Telstra for home broadband, unless they are forced to. 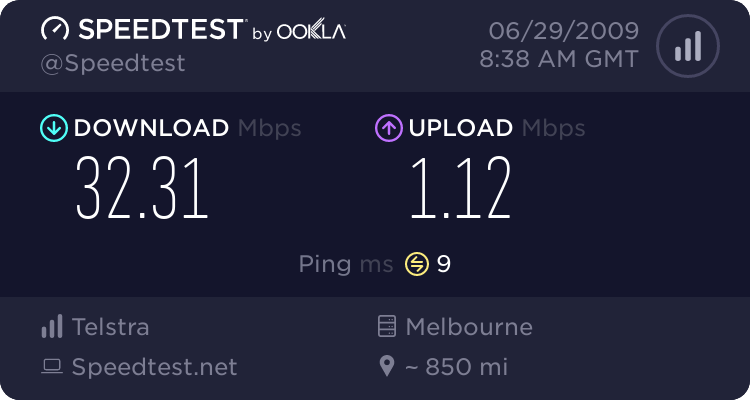 And, even in areas where the Telstra ADSL network is the only choice, you can use a reseller’s product such as Internode “TwoPlus”, that avoids most of the Telstra annoyances. Work out how far your house is away from the nearest ADSL2+ exchange (http://www.adsl2exchanges.com.au/), and unless you are more than 3Km away, the speeds will be comparable to cable. I would suggest Internode or iiNet, but if you use http://bc.whirlpool.net.au/ you can find what is available in your area. It is tempting to switch but shouldn’t Telstra pay if the are over-counting usage. If we switch then isn’t that too easy. Think of how many people may be being over-charged. > Think of how many people may be being over-charged. I am having this looked into for you. Will be in touch soon. I recieved an email this afternoon that I had reached 75% of my usage. Checking the usage meter it said I had used over 9Gb. I hadnt even used 3Gb and tgh modem was on stand-by for most of the day. I checked 2hrs later and my usage had jumped to 15Gb… thats 4gb extra in 1 or two hours, and we werent doing anything and there was no traffic on our non-wireless network. Tech support just apologised and said to ring billing in the morning. This happened last month and I was charged $983.00 in excess fees. I called billing last month and they just told me to fill out a claim form…. This is extremely dissapointing after being a telstra customer for over 10 years. Could ISPs data counting methods be regularly tested and certified in the same way that petrol pumps and supermarket scales are? Joshua: In the early part of the Rudd government you were wholeheartedly supporting those frankly silly anti-commerce measures in Fuel Watch and Cabbage Watch. Now that the two programs have been abandoned because of their absurdity it may be worthwhile for you to visit these subjects with perhaps and apology? What do you think? btw, BigPond cable extreme has a theoretical maximum download speed of 30mbps, not 40. And many factors will prevent you getting that sort of speed, including peak time cable sharing (you share your bandwidth with others on your distribution link) and external website slowness. Try a bandwidth test or just see what sort of speed you get downloading a large file from, say, a microsoft server and you’ll find that it’s well below 4 megabytes/second which is what 30megabits/second theoretically means. And that was 6:30 at night which I understand is peak internet use time.